I was always unhappy with the amount I had to move the arm on my BIGSBY to get the desired tremolo action even though I love BIGSBY’s, after an hour of tinkering and thinking I figured out how it all works and came up with an incredibly simple fix anyone can do. As you can see all i have added is another washer but after thinking for a while i saw that what i needed was a washer that fit over the second larger shaft so that it would add to the compression of the spring, if you tighten the lock nut all the way down without the new washer the spring can still be compressed a bit and when all put together this extra compression space means you have to move the tremolo arm more to get an effect than if the arm was fixed in one place, this mod allows you to compress the spring fully but still be able to swing the arm back. Make sure the second washer goes over the larger shaft and is centered when you tighten the lock nut otherwise it will catch on the side and punch between the nut and where the small and large shafts meet. 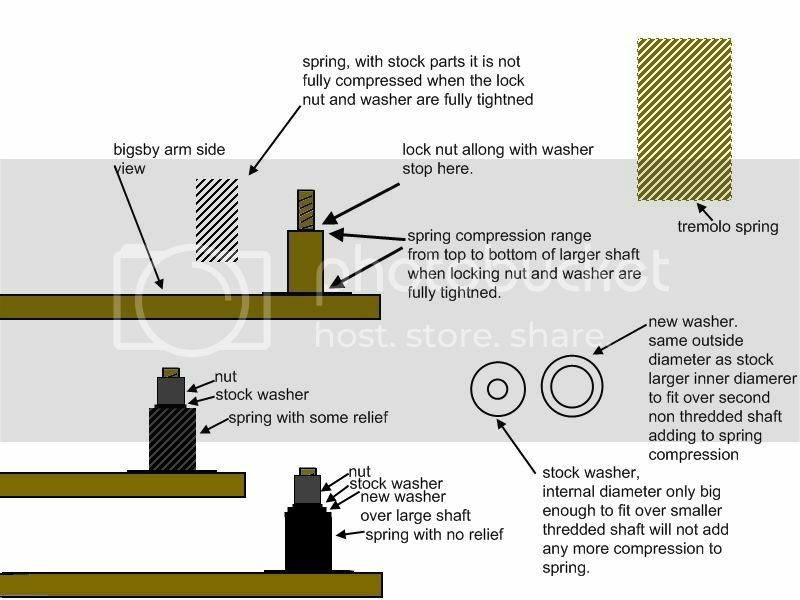 It is also a very good idea to file the ends of the compression spring like the ends of the tremolo spring so they cannot bite the washer or the inside of the arm, doing this will allow for a much smoother action when you swing the arm back. with this mod my BIGSBY works as though it has a fixed arm it completely stable and works much more fluidly. I am able to get a perfect tremolo action with the least amount of movement so now i’m not punching the pick-guard whenever I use the BIGSBY. I hope this helps anyone with a BIGSBY.